Are you a flexitarian? I have heard the terms omnivore, herbivore, vegetarian, vegan and pescetarian. What on earth is a flexitarian? Well apparently it wasn’t even a word until 2012, when it was added to the Merriam-Webster Dictionary. Flexitarian = flexible + vegetarian: a person whose diet is mostly vegetarian but sometimes includes meat, fish, or poultry. My mom recently sent me an article from Mother Earth News, Becoming a Flexitarian. which outlines the basic flexitarian approach – eat less meat and eating grass-fed when you do. There are a lot of great reasons to eliminate or reduce meat in our diets, including health, the environment and humankindness. Perhaps a Flexitarian approach is more doable for people than going vegetarian or vegan and can actually help promote local farming as a profitable business by only buying grass fed, humanely raised meat from responsible growers and not from the big factory farms. 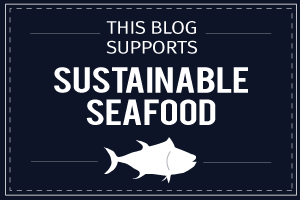 I personally apply the same principles to purchasing eggs, milk and other animal products. The good news is that people who don’t eat meat, i.e. vegetarians and vegans, are becoming more main stream and there has been a shift in the public perception to consider where your meat has come from for health, safety and animal rights reasons. Vegetarianism has come a long way from the hippie culture of the 70’s as evidenced by widespread programs like the Meatless Monday Campaign which has gone global. It’s been over a year since I’ve eaten meat (although I do eat fish and the occasional chicken that has been locally farm raised) and I don’t miss it. It was an easy adjustment for me since I never ate huge quantities of meat anyway, except maybe for bacon. Anyway, I feel good about my choices and now I have another moniker, Flexitarian. Thanks Mom! 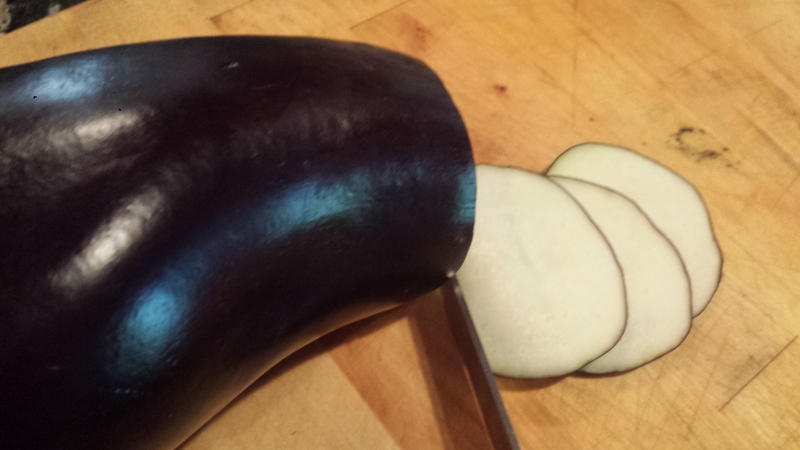 Thinly slice eggplant using a sharp knife or mandolin. Spread the slices on a flat surface and sprinkle them with salt and let sweat for at least 10 minutes. 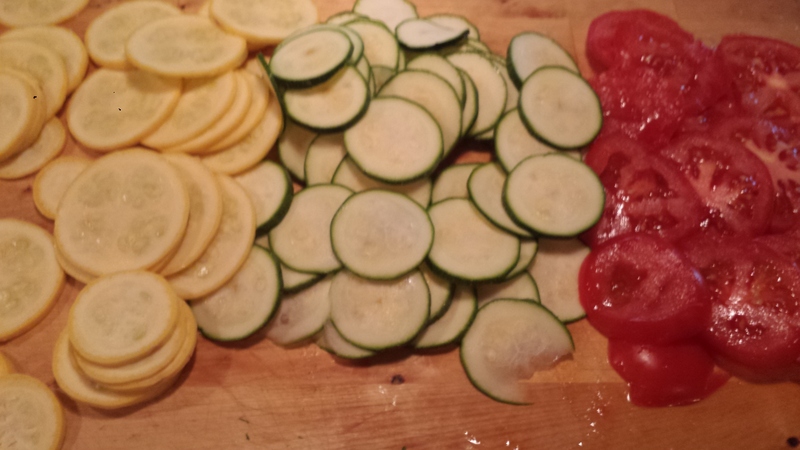 Thinly slice zucchini, squash, tomato and mozzarella. Pat eggplant dry and place in a large bowl. 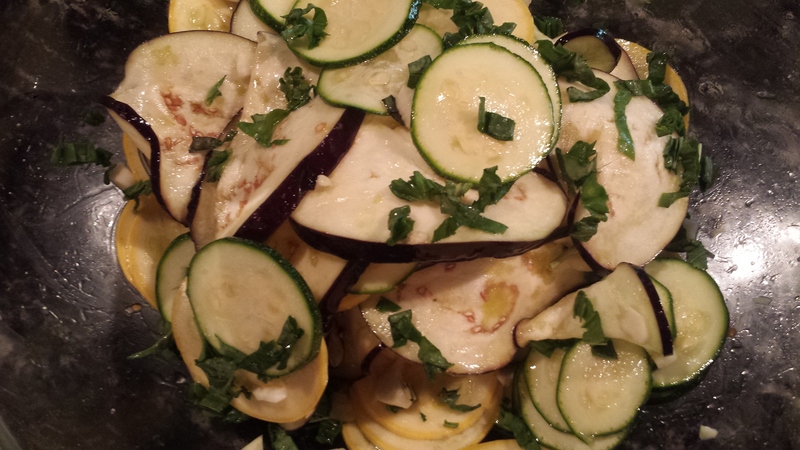 Add zucchini and squash, garlic and oil. Gently mix to evenly coat all veggies. 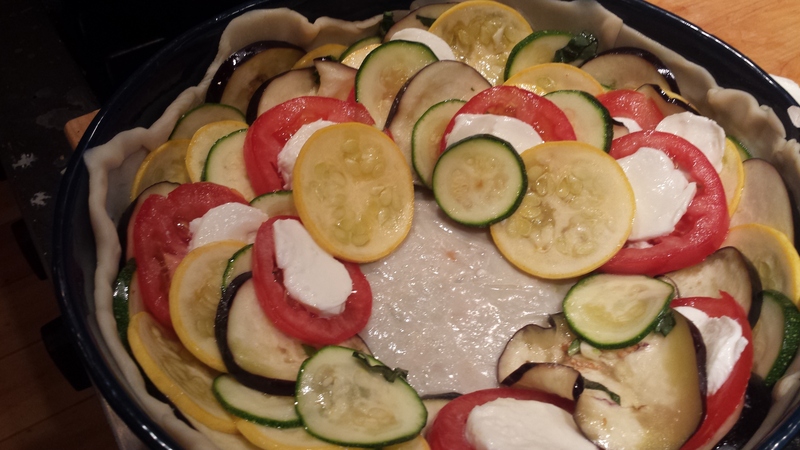 If you are using a crust, spread it evenly in the bottom and up the sides of an ungreased pie or quiche pan. If you’re not using a crust, spread a little oil in the bottom of the pan to prevent sticking. 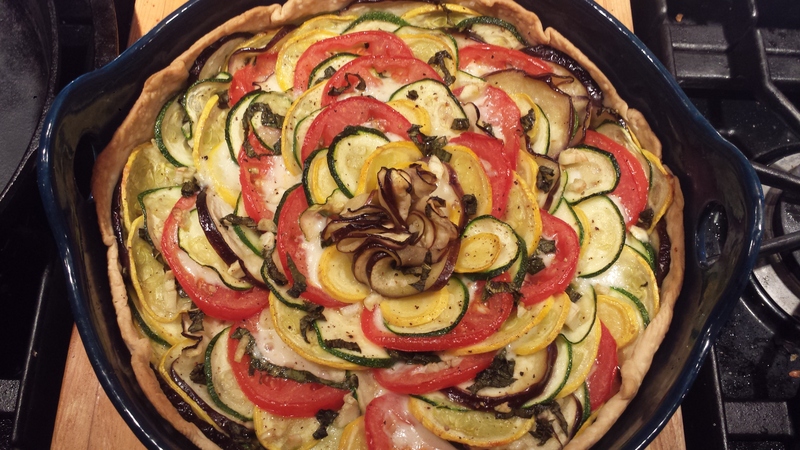 Arrange the veggie slices in a circular pattern starting at the outside making sure the veggies go up the sides of the crust. 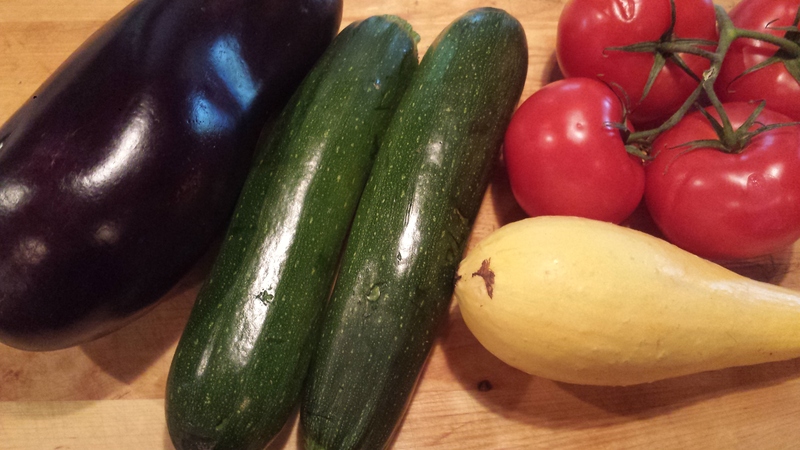 I did a couple of rows of eggplant and squash before adding tomatoes and mozzarella since they are so soft. 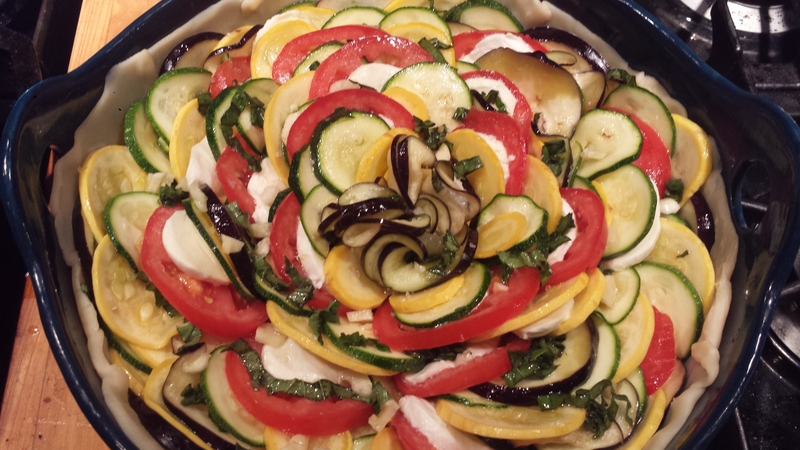 For an even less fussy dish, just layer the vegetables and don’t worry about the pattern. It will still be delicious. Keep arranging toward the center, pushing the slices towards the outside and into a more vertical position as you go. The more vertical you go, the more veggies you can use. Save a few of your best thin slices of eggplant or zucchini and roll or fold this into flower like shapes to decorate the center. If you have any leftover slices, just slip them in anywhere. Slide any remaining garlic and basil between the slices. Bake in a preheated 400 degree oven for about 45 minutes or until the vegetables are done and the rust is golden brown. Remove from heat and let cool a bit before serving. Also good at room temperature. 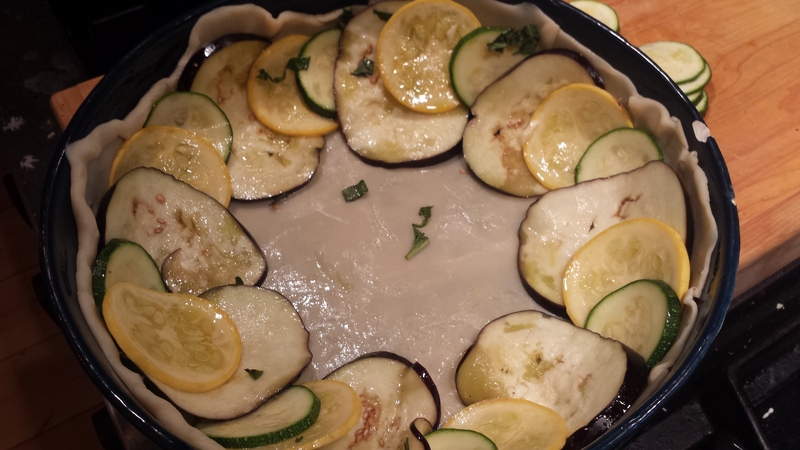 This entry was posted in All Recipes, Meatless Monday, vegetarian and tagged Eggplant, flexitarian, Meatless Monday, summer squash, Summer Vegetable Tart, vegan option, vegetarian, zucchini. Bookmark the permalink. Yum, Joyce. Beautiful and looks delicious. Thanks Margaret. I’m definitely making this again! 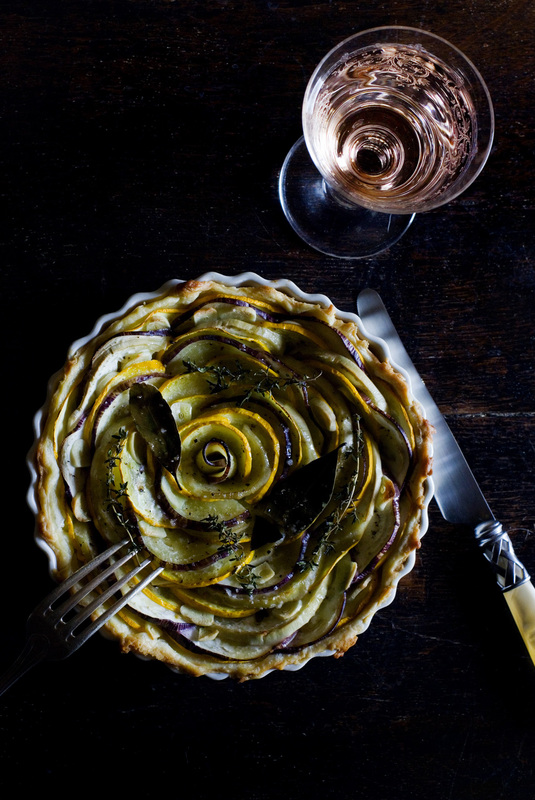 What a pretty tart! Will be making it very soon. Oh good. I hope you love it! Here is some feedback from the other side of the pond (we live in France). I must tell you that this savory pie, baked on my homemade « universal » gluten-free pie dough, was a success. 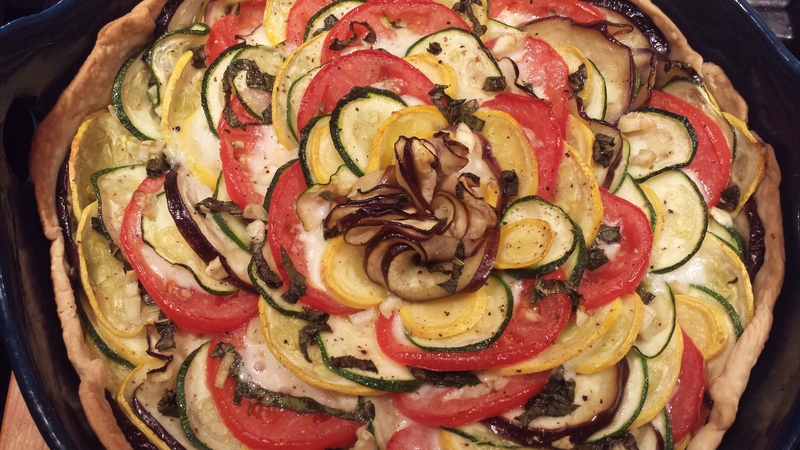 Even my husband, who can be picky when it comes to vegetarian dishes said « Actually, this isn’t bad! ». So thank you for this tasty and healthy recipe, Joyce. I will be making it again. Thank you for the feedback. I’m glad your husband liked it too. I have found it to be a crowd pleaser. I would love to have your GF crust recipe if you don’t mind sharing.